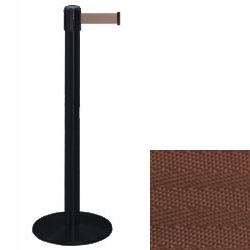 This is a satin black crowd control stanchion with 7 1/2 foot brown belt. We recommend spacing them no more than 7 feet apart. The color combination is a welcome change from some of the more common belt colors. This will add a classy, yet subdued style to your area. These posts are the industry leader and have been for many years. The quality and service is unparalled in its market place. This post measures 38" tall has a 13 1/2" diameter base, and weighs 24 lbs. The belt is approximately 2" wide. 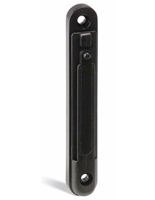 These stanchions feature a metal weighted base with an ABS plastic cover to help minimize scuffs from everyday traffic.